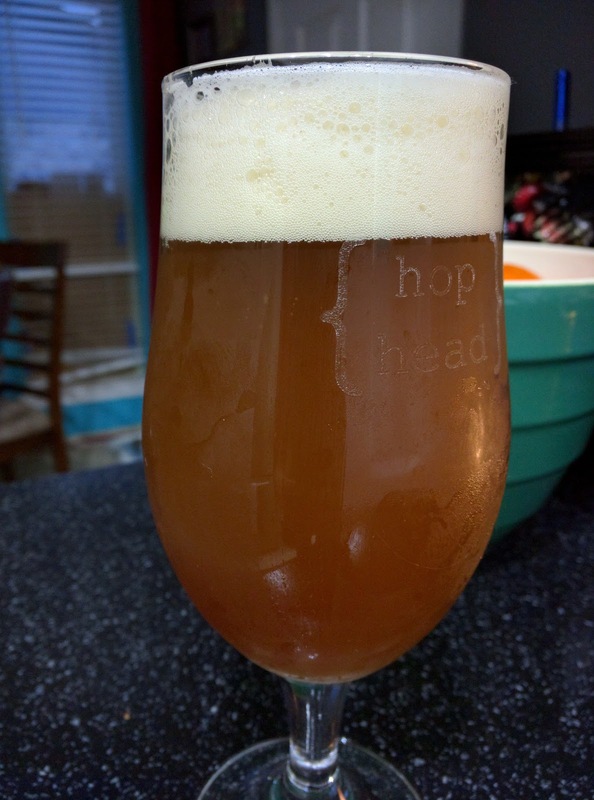 After the azzaca hops test batch I made, I really wanted to do a more heavily hopped version to really bring out that flavor. I also wanted to use it up; they weren't getting any fresher sitting in the freezer. The recipe below is the result. One issue with it was the yeast. My LHBS did not have the Wyeast 1318 yeast I wanted to use, so I settled for Wyeast 1968. After reading a bit about it, it sounded like a decent yeast to use in IPAs. Maybe I didn't do something right, but I was not that impressed with it. The hop flavors were kind of mild, and there was a bit of a toasty/buttery note that did not work. This yeast is known for needing a diacetyl rest, so maybe I didn't yet it do long enough. In any case, it was definitely drinkable, and i might have even enjoyed it. Just was a bit of a disappointment. It never got any clearer than this, but that's okay I guess. Head was very persistent. Pitch a 1/2 cup of goop from Oatmeal stout (Wyeast 1968 ESB) and aerate with immersion blender. At 10 days, dry hop with 2 oz of Azzaca hops (10% AA) for 2 days because the study said so. 2/7/2015: Brew Day. 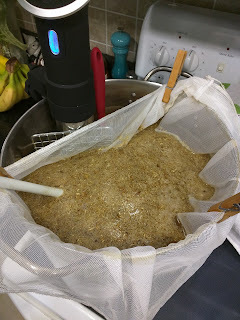 Starting gravity was 1.062. Added some fermcap after aeration. Vigorous fermentation had started by nightfall. 2/9/2016: gravity is about 1.019. Gave it a swirl as well. No longer under temperature control. 2/17/2016: dry hopped. Weighted down with a shot glass so it sinks. Smell: tropical fruit hops apparent. Taste: slight toasty popcorn type flavor. Fairly restrained bitterness. Tropical fruit flavor. A bit of spiciness. Bit of sweet honey as well. Relatively thick mouthfeel, did not dry out as much as I would have liked. Slight tartness. Overall impression: a little disappointed with it, the toasty flavor is not welcome. I'll gladly drink it though. 3/28/2016: keg kicked. 232oz served.